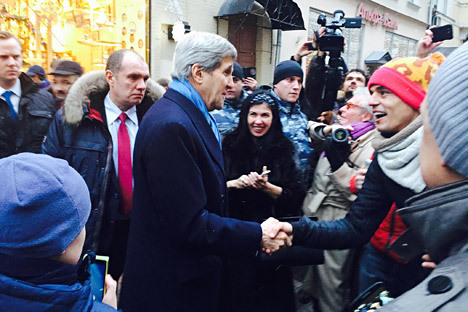 U.S. Secretary of State John Kerry walks on Arbat Street in Moscow. RBTH presents a selection of views from leading Russian media on international events, featuring reports on U.S. Secretary of State John Kerry’s visit to Moscow, the successful test of a new Russian deep-water apparatus, and the 2016 launch of the Russian payment card Mir. On Dec. 15 Russian President Vladimir Putin hosted U.S. Secretary of State John Kerry and Russian Foreign Minister Sergei Lavrov in the Kremlin, writes Kommersant business daily correspondent Andrei Kolesnikov, who is part of the presidential journalist pool. At the mansion of the foreign ministry, writes Kolesnikov, the secretary of state, "an old romantic," saw a Christmas tree and became sentimental, studying Santa Claus and then even embracing him. Mr. Lavrov quickly explained that according to the rules of hospitality, he must give the toy to the guest. Kerry accepted the souvenir. This was Russian diplomacy's first victory. Later, sauntering down the Arbat, John Kerry bought a matryoshka, a rag doll and two amber rings. Kerry in Moscow: What did Russia and U.S. agree on? At the Kremlin, before the meeting with Vladimir Putin, the secretary of state was clearly nervous, writes Kolesnikov. Vladimir Putin sat him down at the table, attentively looked at him and said that he had been following Kerry's travels throughout the world, adding that the secretary of state should "get some sleep." John Kerry preferred not to react to this remark. The talks lasted for more than three hours. The sides discussed issues they can agree on: the lists of the warring parties with whom it is possible to negotiate and those of the groups that are linked to Islamic State (ISIS). Speaking in front of journalists, Lavrov and Kerry said that they had agreed to meet again on Dec. 18 in New York along with the international support group, so that after the meeting they can send the UN Security Council a resolution project on resolving the situation in Syria. In response to the question of why the secretary of state was speaking with the Russian president on Russian turf, Kerry said that the U.S. is opposed to the annexation of Crimea, but Washington does not have a policy aimed at isolating Russia. "This is a demonstration of the two leaders' maturity. During the war in Syria we were able to remove the chemical weapons from Syria. This had never happened before!" added the U.S. Secretary of State. The Vzglyad business newspaper reports that the Russian oceanographic vessel Yantar has tested an apparatus off the coast of America that is capable of submerging to a depth of more than six kilometers. According to Vzglyad, the Pentagon has officially confirmed that, being part of the Russian deep-water program, the apparatus represents a danger, meaning that Russia now has an ace in "the battle for the Arctic." The three-man crew from the autonomous apparatus, named Rus, submerged to a depth of 6,180 meters (20,275 feet), a result that surpassed the 6,000-meter depth achieved by the Russian deep-water apparatus Consul. Currently, only a few countries in the world possess such apparatuses and the technology necessary for their construction: America's Sea Cliff, France's Nautile and Japan's Sinkai 6500, which has the record of reaching a depth of 6,527 meters. Russia has an enormous advantage in the production and use of deep-water bathyscaphes also in its icebreaking fleet. The NATO countries have a developed rescue service, writes Vzglyad, but they lack a fleet. Only Canada can boast some quality medium-tonnage icebreakers. The CIA has a program for following Russia's developments and technologies for deep-water apparatuses. America is still very sensitive about them being part of the Russian navy. The business daily Vedomosti reports that on Dec. 15 the National Payment Card System (NSPK) announced the launch of the Mir card (Mir means “world” or “peace” in Russian – RBTH). Seven banks participating in the pilot project (among which are Bank Rossiya and Gazprombank) have started collecting orders from their clients. However, the mass issue of the card will take place only in the second half of 2016, said Russian Central Bank Deputy Chairwoman Olga Skorobogatova. One of the most important questions concerning the Mir card is whether it will be accepted abroad. In order to be able to use the card in other countries NSPK has made co-badging agreements with MasterCard, JBC and American Express. Moreover, NSPK also expects to make such an agreement with the Chinese Union Pay in 2016. The essence of co-badging is that within Russia the card functions as Mir but abroad as a card belonging to the international payment system. The launch of the national payment instrument is the second stage of the establishment of Russia's NSPK. The first was transferring Russian Visa and MasterCard transactions to the NSPK.